Hui Neng, 6th Zen Patriarch. He showed how no practice is needed to attain Enlightenment. Practice is for the body and mind, not the realisation of our True Nature. How could practice be needed to discover that which we already are? An illiterate layman, Hui Neng could be found gathering fire wood to sell to take care of his mother, until his enlightenment. 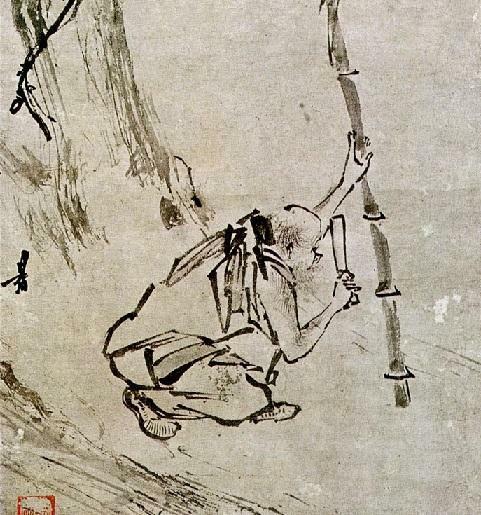 After he was secretly given the robe and bowl of Bodhidharma, he had to run for his life from the monks of the temple who had studied so hard to attain something. Only 5 years later did he take vows, shave his head, and become a monk. We need nothing, in order to attain nothing. …When the Patriarch saw the stanza the next morning, he instructed that it be read and recited by all the disciples, so that they might realize the Essence of Mind. At midnight he sent for Shen Hsiu to come to the hall, and asked him if the stanza was written by him or not. “It was, Sir,” replied Shen Hsiu. “I dare not be so vain as to expect to get the Patriarchate, but I wish Your Holiness would kindly tell me whether my stanza shows the least grain of wisdom.” “Your stanza,” replied the Patriarch, “shows that you have not yet realized the Essence of Mind. So far you have reached the ‘door of enlightenment,’ but you have not yet entered it.